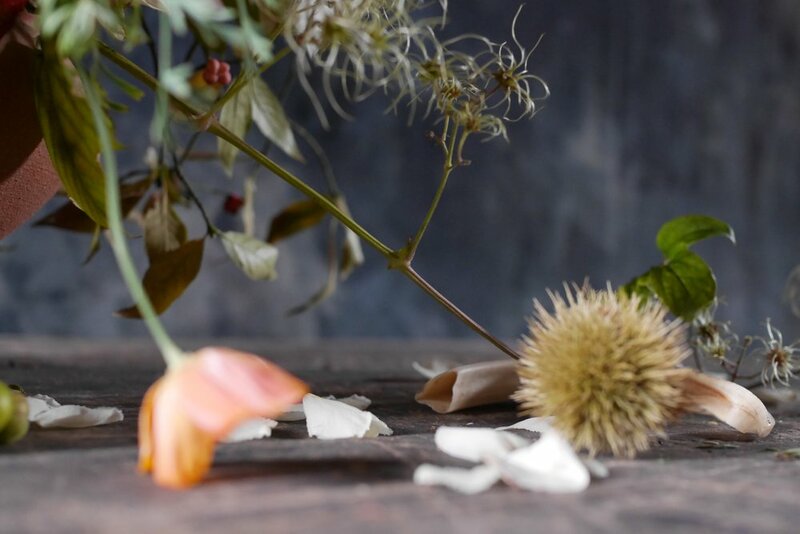 While in England in September, I spent two days with Jess and Alex of Aesme Flowers. Their West London studio is tucked into the railroad arches at the Shepherd's Bush tube stop. Shepherd's Bush was far more bustling than the sleepy Kew Gardens stop where I got on, after a few minutes of getting my bearings, I found my way - it's just beyond the impossibly skinny rockers standing outside Bush Recording Studio and the grimy mechanics in jumpers. Once I found their arch, I was greeted by Alex and her Irish terrier, Mavis. 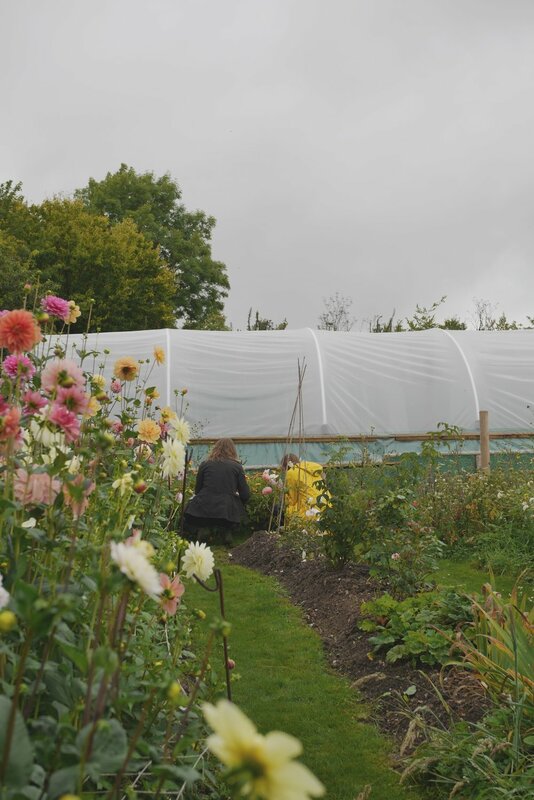 Once Jess and our roses arrived, we fueled up with coffee and croissants, and headed out of town to do some cutting and foraging in their country garden. Through the rain, we cut and filled the van breaking only for snacks and tea in the poly tunnel. Obviously, I was in my element and couldn't have been happier! Day two was filled with in depth conversation and design. Jess and Alex worked in tandem on their still life, followed by me. Our third design of the day was a team effort. We took down the dark hand painted backdrop we had been using for our Dutch Master inspired arrangements and opted for a beautiful bisque colored cloth which paired well with our pink toned design. Thanks to Alex and Jess, who were a perfect pair for me to spend time with. It's always a treat to link up with like minded designers and spend a couple of days chatting about all the things - flowers, houses, food, family, business, life. 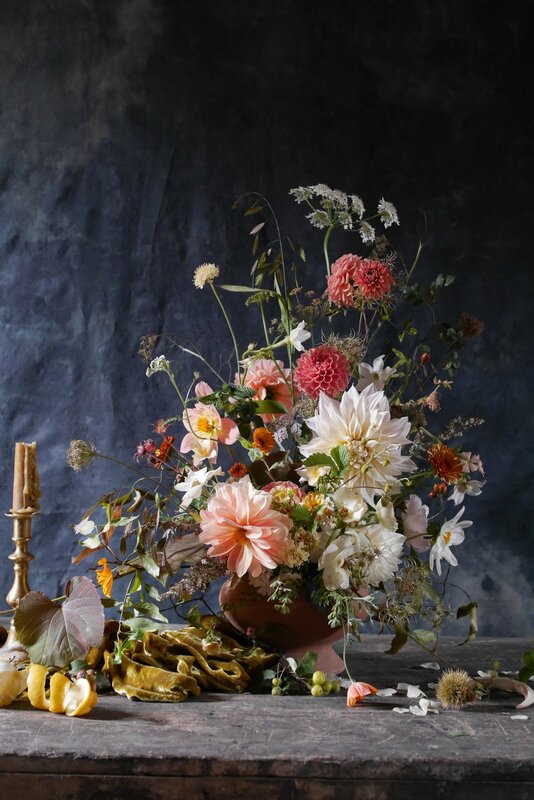 If you find yourself in London, and are considering a flower class - look these women up! In the early part of 2017 I learned about a travel scholarship opportunity through the Toledo Museum of Art. The Palmer Scholarship provides funding for travel expenses in order to pursue an art related experience. With the application deadline looming and just a couple of weeks to research and design a proposal - I turned to my curiosity around Dutch Master floral still life paintings. A couple of years ago I discovered a painting by Rachel Ruysch at the TMA and immediately became interested. As an avid museum goer, I admittedly never paid attention to this genre before. However, something about the way I was viewing flowers at that moment in time and accepting them as my medium, not merely a job - had me taking a closer look. I began to be excited by forgotten flower varieties, surprising foliage, and the use of decay. With this in mind, I felt a deeper study of these paintings would make me a reasonable candidate for the scholarship. I was right. As an extra treat, I received my winning notification the week of my 40th birthday! Then real planning began. In my proposal I stated that I would visit a number of museums in Europe with well documented collections, and a floral study alongside a florist of my choosing. Squeezing my trip in between weddings and wanting to make sure I would be seeing gardens in bloom landed me at early September. I took off for London and Amsterdam, with goals of 3 museums and one floral workshop. My first stop was the National Gallery in London. They have a small but beautifully curated room dedicated to only floral still life paintings. Then off to The Ashmolean in Oxford. Their collection is also in a single (although large) room, which includes all manner of Dutch and Flemish still life. Again, the florals are outstanding. Finally, The Rijksmuseum in Amsterdam. I had been to Amsterdam a number of times before but never felt the pull to go that particular museum, feeling more at home in quieter museums. As expected, it was my least favorite of the three, but it did give me insight as to why these paintings exist. These paintings are chock full of imagery beyond flowers. The botanical and life like accuracy of insects, animals, shells, flowers, and fruit draw you in. While it could be said that the early artists were speaking to the transience of life and it's earthly matters - it is likely that the later artists were largely creating these pieces as examples of skill for buyers of decorative art. After all, the paintings were mostly illusions. The undulating stems and unlikely collections of blooms were purely for the sake of the composition and not a study of an arrangement in front of the artist. While still in London, I had the pleasure of spending two days with the sister duo behind Aesme Flowers. The Aesme aesthetic is very much aligned with my own - a relaxed natural approach to design and working with the seasons. I had a feeling that Alex and Jess would be a perfect complement to my studies as they have a shared interest in the Dutch Masters. We spent the first day getting sopping wet in their cutting garden outside the city and the next trying our hands at recreating our own still life displays. Armed with props and flowers we spent the day collaborating and waxing on in great detail. Digging into the rigidity of some arrangements and the distinct "S" curve of others. What a struggle it was to leave behind our own rules in favor paying homage to these paintings. We were bound by the flowers available in the September garden- which made some common themes a challenge. The strong blue moments, heavy headed blooms towering above the rest, and unnatural arcing stems. In the end, it was pure luxury to have a day for conversation and reflection, arranging and rearranging.